Whether it's a complex design or a simple logo on your sign our sign designers can make it happen. Our sign design technology allows you to place virtually any graphic or photo on your sign to get the absolute best look and image for your business. Our manufacturing partner has been designing signs for over 50 years, and they REALLY know how to make an amazing (aka eye-catching) sign. Our professional designers will your sign vision come to reality. Once you and your potential customers see it in front of your business, you'll be blown away. When we say our talented sign designers can work miracles with your sign design we're not kidding! 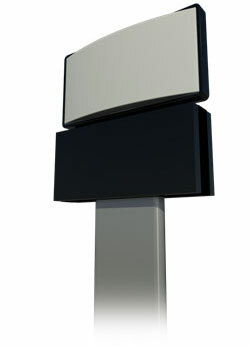 We use an extremely strong extruded, anodized aluminum for the construction of each sign frame. This type of metal is made to withstand the toughest conditions you can find on the planet. We know you're sign is going to be in the elements for years to come. In high wind areas? Each sign is engineered to withstand hurricane force winds. Not only are our signs extremely rugged, but they are also elegant which enhances the image of the sign and your business. All frames are engineered to the strictest specifications and meet the sign codes of every city in the United States. A stamped engineering plan is available for every model. 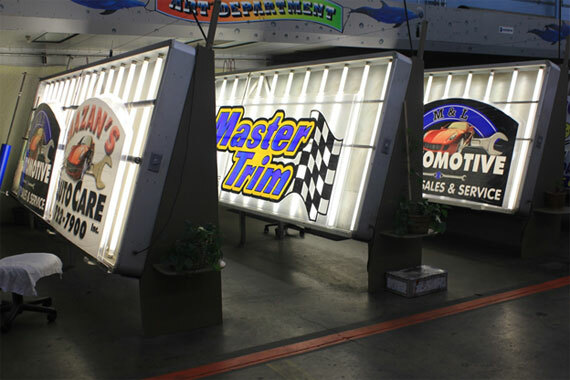 We make sure your sign has the maximum illumination coverage across the entire sign, so we only use high-output, instant-start fluorescent lighting. You won't see any "shadows" or "dark patches" in our signs. Heavy-duty outdoor ballasts ensure the sign won't be affected by inclement weather - whether it's rain, sleet or snow. Lighting is provided by high output fluorescent 40 watt lamps. Each sign has one vertically mounted bulb per each linear foot of sign, plus two additional bulbs. (ie. an 8' length sign has 8 bulbs.) These are the brightest signs on the market. All of our manufacturer's products carry the "UL Listed" label from Underwriters Laboratories. Manufacturers must adhere to strict production and manufacturing policies to carry the UL Label. We use an indestructible polycarbonate material that can withstand just about any form of breakage, including vandalism. It is U.V. protected and will withstand the harshest of environments. We guarantee the sign face panels against breakage of any kind for 10 years. A polycarbonate resin is the world's foremost engineering thermoplastics for vacuum formed graphics. One of the toughest and most versatile polymers, its unique combination of features is used to add high quality and high performance to thousands of products. Our electric sign construction partners have the ability to vacuum form a single sheet of Lexan® up to twenty feet (20') in length. This creates seam-less one piece lighted signs. The sign faces are painted using a special acrylic based paint that actually etches into the plastic and won't peel, chip or fade. Graphics, Logos, and Images are permanently applied through a roller coating and\or air brush process. Photo quality images can be rendered with a very high resolution printer, and then are incorporated into the polycarbonate face panels. Vacuum or pan formed polycarbonate is the Gold Standard of the franchise industry. Durable, brilliant, visible from a longer distance do to the multi-dimensional effect. Its low cost, no maintenance, and professional. We want to make sure you can mount your sign where you WANT and NEED it. The visibility of your sign is critical. It could mean the difference between people seeing your new sign and driving right by. That being the case we certainly know the importance of your sign mounting options. Because of this we've created special mounting brackets to prepare for many different sign mounting situations. To make installing your sign a breeze your sign is shipped with the mounting brackets attached and ready for quick and easy installation once it arrives at your location.